Many of us welcome easy access to technology, lured by the promise of better connection with others, greater engagement and a more efficient life. But psychological research confirms that social media can actually increase stress, disconnection, inefficiency and feelings of inadequacy. So how can we harness technology to boost wellbeing and create a healthy digital life? Thriving in the digital age requires making the most of our ability to connect but avoiding overload, according to the Australian Psychological Society, which has released tips for evading the pitfalls of the online world for Psychology Week 2017. Psychology Week is an annual initiative of the Australian Psychological Society that aims to increase public awareness of how psychology can help Australians lead healthier, happier and more meaningful lives. This year the focus will be Thriving in the digital age and ways to help Australians improve their happiness and wellbeing. Social media has become a really important means of communicating and is basically integral to most of our lives in one form or other. However, we have also seen it affect people’s behaviour in some less than positive ways. Disagreeing and name calling have become common online and that behaviour can easily become anti-social drifting into trolling, stalking or cyberbullying, while constant notifications can leave us anxious and distracted. Here are 8 simple strategies that can help ensure you have a positive experience online and you aren’t being ruled by your technology. Insights from positive psychology reveal the factors that can help people be happier and more satisfied. Wellbeing has many facets. One theory of wellbeing – set out by Martin Seligman, one of the pioneers of positive psychology, in his 2012 book Flourish – identified five key elements which underpin people’s happiness and life satisfaction. These are positive emotion, engagement, relationships, meaning and accomplishment, or PERMA for short. Psychologists have since built on this, adding a plus – healthy behaviours – which also contribute to wellbeing. Though we live in a complex and demanding world, people may experience higher levels of wellbeing if they focus on these important factors in life. 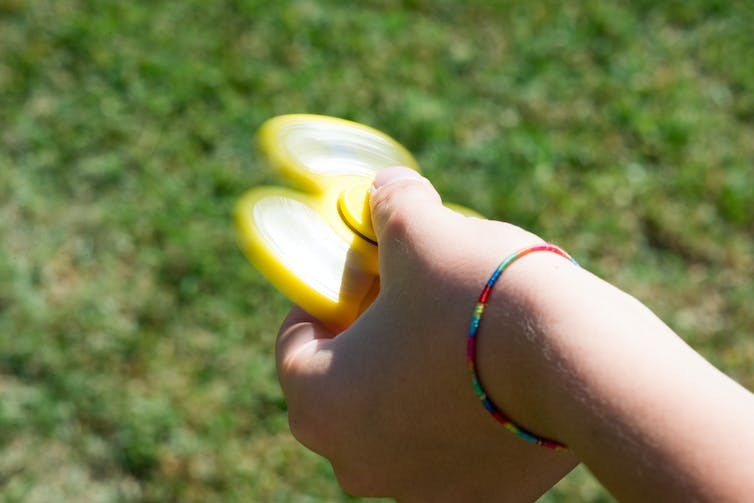 Hand-held toys known as “fidget spinners” – marketed as “stress relievers” – have become so popular and distracting in classrooms that they are now being banned in many schools. And it’s not just kids who like to fidget. Look around your office and you will probably see people bouncing their legs up and down, turning pens over and over in their hands, chewing on things, sucking on their lower lips and pulling bits of their beard out – seemingly completely unconsciously. But why do we fidget, and why do some people do it more than others? And if it really helps to relieve stress, does that mean we should all embrace it? These are actually rather difficult questions to answer, as there appear to be various definitions of what fidgeting is and why it happens. However, there are some interesting, if unexpected, theories.